“Le Grand Concours” is a French event in the form of a 60 minute national test, designed, written, financed and disseminated by the members of the American Association of Teachers of French. 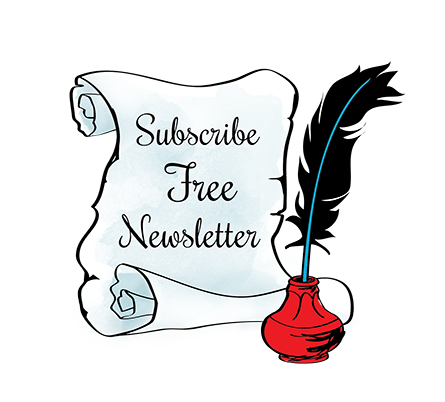 Its purpose is to help stimulate further interest in the teaching and learning of French and to help identify and reward on the part of both students and teachers. All students of French from grade Kindergarden through senior high school, are elligible. In addition, students studying French on overseas campuses, with a private tutor of any formal classroom instruction in French, or via home-schooling, are all eligible to compete for awards. Le Grand Concours FLES at the Elementary level will take place mid February each year. FLES ( Foreign Language in Elementary School) is any foreign language instruction for children in grade 1 through 6. There is no specific text or method imposed. We did not participate in 2013. National Winners 2012 Camilla and Lena. 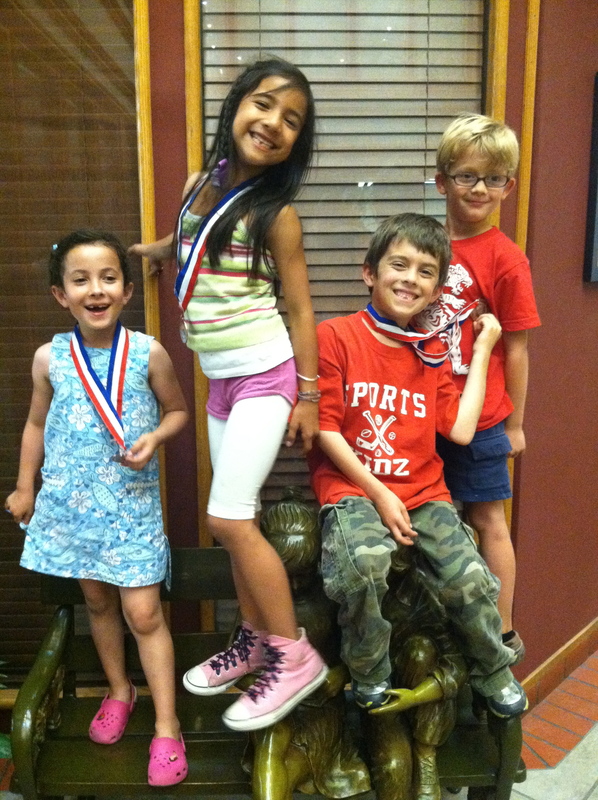 National French Contest 2012 Winners Lena, Camilla and Aiden with their classmate Raoul. 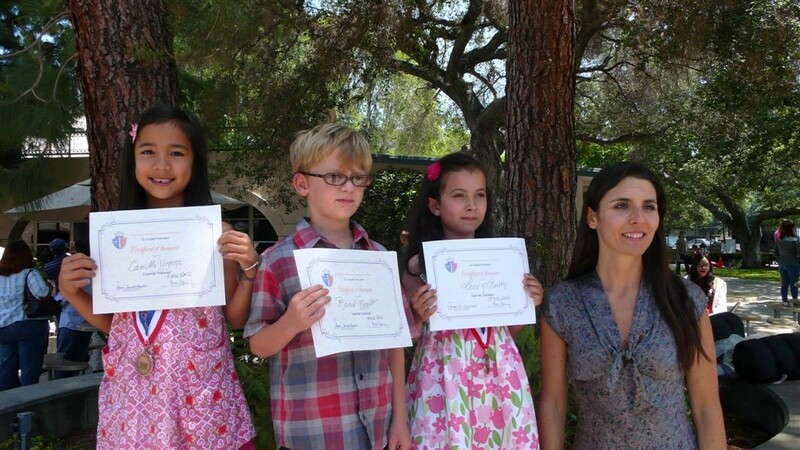 Our students rocked the National French contest 2011! Ellie, 2nd grader, placed 5th nationally. Way to go, Ellie! You are a national winner two years in a row; Wow! Ilsa, 2nd grader, placed 8th nationally: congratulations to Ilsa who participated for the first time to Le Grand Concours: we are so proud of you! 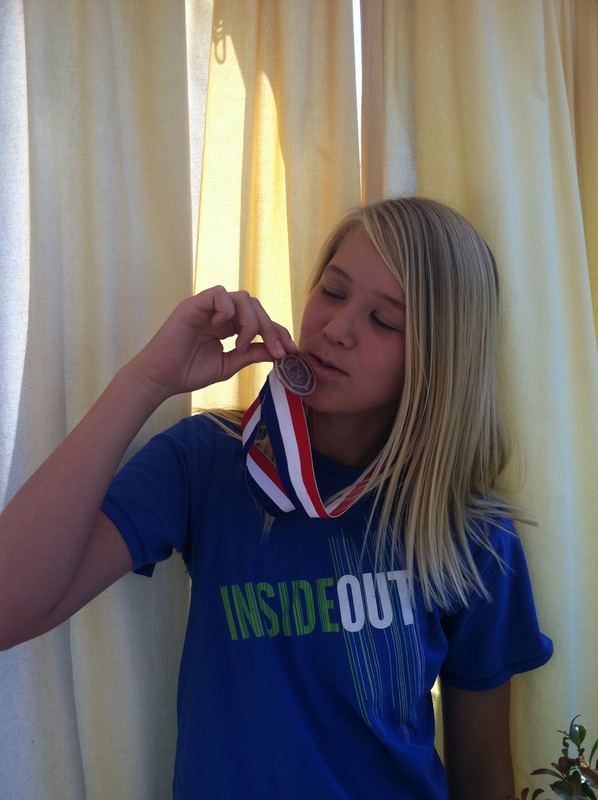 Chantal placed 3rd in Southern California and 7th nationally. 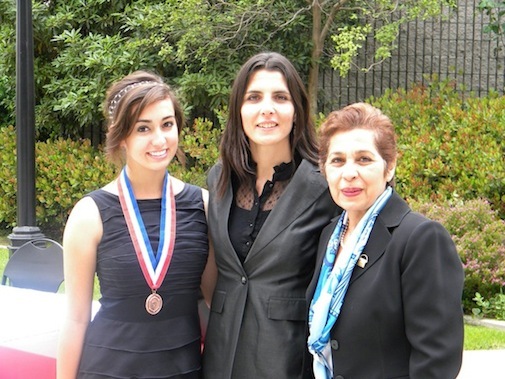 Ana Elisa placed 10th in Southern California and 10th nationally. Congratulations to Ana who took the Level 3 HS National French contest as a 9th grader with only two hour of French a week; you rock Ana! 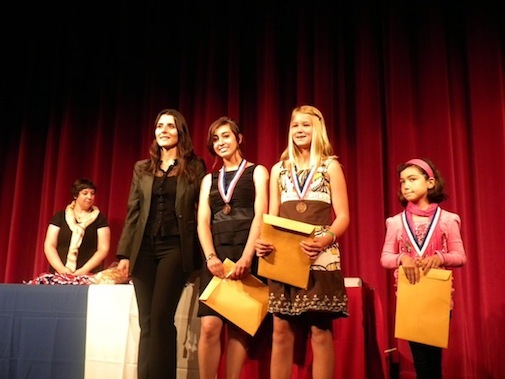 Ellie and Ana, our 2010 national winners, received their medals and certificates at Flintridge College Prep in La Canada, California. 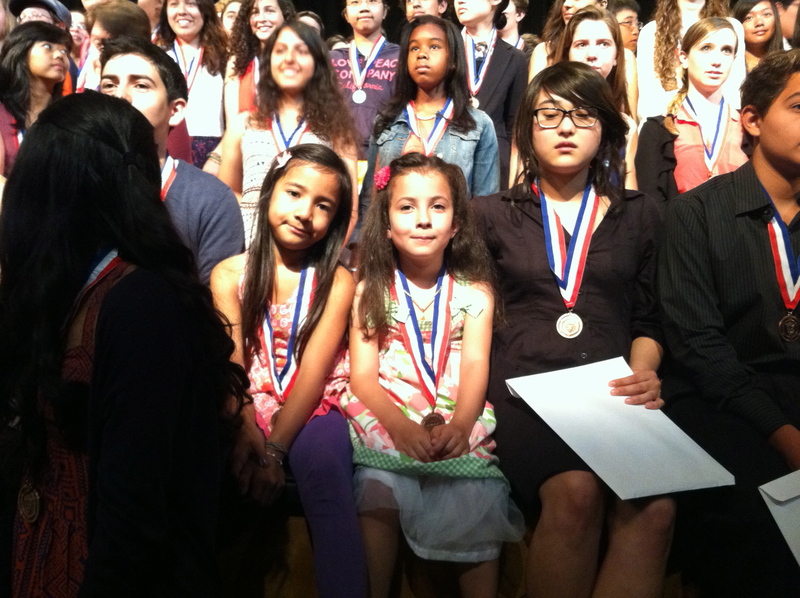 Ellie, first grader ranked 4th nationally in her category and Ana, 8th grader ranked 9th nationally in her category. 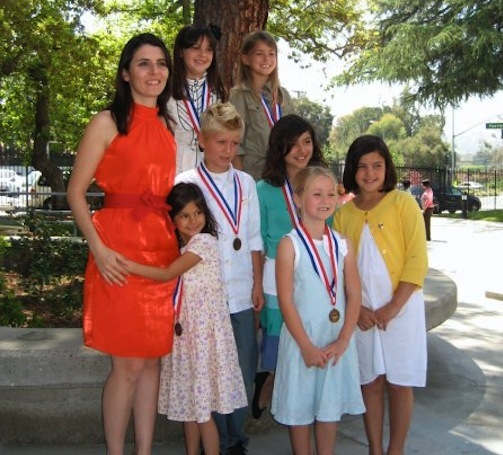 Chloe, Sidney, Shelby, Caelum, Shayanne and Atalia were all national winners in 2009; their achievement at the National French contest was recognized at Flintridge College Prep in La Canada, California where they received medals and certificates. Shelby (top row on the right hand side) ranked 2nd in the nation in her category. 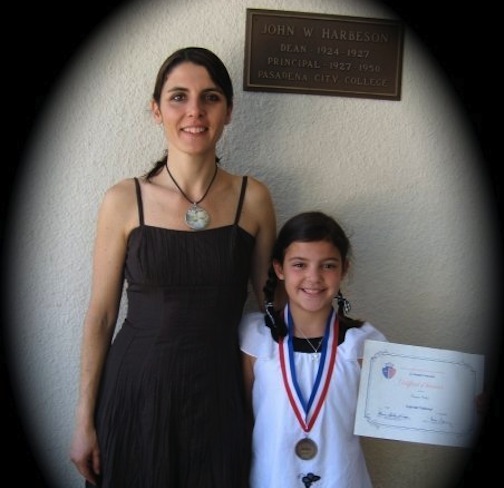 Evanne a second grader was one of the National French Contest winners 2008. She placed 5th nationally in her category becoming the youngest winner in Southern California. 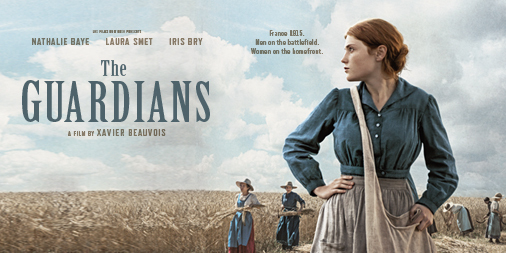 Evanne is a non-native speaker whose parents speak no other languages besides English. 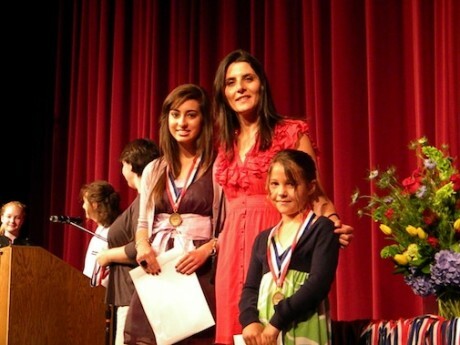 She received her medal at Pasadena City College.